(Newser) – It wasn't quite death-by-selfie, but it wasn't far off. 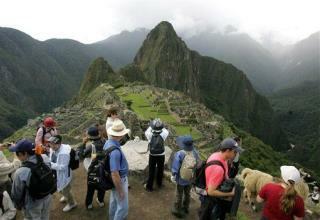 Peru This Week reports that a German tourist died Wednesday while posing for a photo at Peru's famed Machu Picchu site. Oliver Park, 51, went into a restricted area of the mountainous tourist locale in the Andes, despite warning signs and instructions from wardens, reports the BBC. The news agency says that while posing for a photo at the edge of a ravine, Park apparently decided to jump in the air to make it look like he was flying. Instead, he ended up falling off the cliff. If the guy didn't get his picture taken while falling then it was all for naught. Why do so many people think they can violated restricted area signs? Sorry to be so blunt, but they deserve what happens to them.